Three years ago, Philippa Willitts looked at how The F-Word might appear to disabled people who aren’t familiar with the site. She focused on instances of disablist language and the visual representation of disabled people in the images we use. This internal review highlighted the urgent issues we needed to address and prompted us to start a disablism working group to help us take action. The following year, we summarised the review results on the site and outlined what we had been doing and what we would be investigating over time to help us achieve our goals. Last October, Megan Stodel conducted another internal disablism review to track our progress in this area. Some of the results indicated we had improved (e.g. in terms of editorially intercepting and challenging lazy, outdated disablist terms such as the use of ‘crazy’ and ‘insane’ to describe something being viewed negatively). However, a key area where we clearly had – and still have – a long way to go was in our use of images of disabled people. Megan’s picture review focused on visible impairments, which do not represent all types of disability, but nonetheless provided a visual cue in terms of how welcoming The F-Word is to disabled people who do not already run, write for or read the site. posts where images were promotional (for example, an album or book cover related to a review). …There were frequent instances where [representation of disability] was not entirely clear, particularly in large crowds (I counted people if I could make out any of their facial features, but not indistinct faces blurred in the distance) or if faces were partially or almost entirely turned away. If I was uncertain, I included the images in the analysis. However, a repeat study might find slightly different numbers. The original review acknowledged that there may be a difference between the proportion of images showing people with visible impairments and the proportion of people shown with visible impairments, especially due to large crowd scenes. I therefore considered both for a fuller picture, though only the latter was considered in the original review. Although the proportion of images showing people with visible impairments has increased, this is only because of the incredibly low benchmark of 0% set originally. There was one photo in the entire time period since May last year that showed the faces of people with visible impairments. For context, in the UK, an estimated 1.9% of the population use wheelchairs. This is just one way in which it might be visible that somebody is living with a disability. However, even this shows us that the site underrepresents people with visible impairments. This means we still need to do better. However, we’ve been struggling to find a good selection of pictures featuring visibly disabled people in connection to a variety of topics through the usual avenues of free stock pictures and Creative Commons searches via Flickr, Wikimedia and Google. In our commitment to actively seek out images of disabled people, this has led us to take steps to build our own resource. For this purpose, we have created an invitation-only Flickr group for F-Word readers and contributors to share their own photos or illustrations featuring under-represented groups, with a particular focus on images of and by disabled people. As previously discussed, one of the problems of diverse representation within stock images is that women with marginalised bodies have reasons to fear putting images of themselves up for use in any context. We’d like to create a safer space where that can happen. As per our usual approach, you will always be fully credited when your image is used and the pictures would still be owned by you. They can even be described as ‘all rights reserved’ (i.e. we can indicate that The F-Word is not sharing the images as Creative Commons items available for free use by everyone). As a team, we will be looking for Creative Commons/public domain images to add, but all Flickr group members will be welcome to share any they think might be relevant. In line with the fact that we’re entirely not-for-profit (i.e. none of us are paid here), participation is entirely voluntary. This is problematic in an intersectional context, but we hope that not being beholden to benefactors or advertisers means that we are free as creators and contributors to make the space our own (i.e. a creative community where each creative contributor/writer is able to benefit from the established F-Word brand, while contributing as much or as little as their own personal commitments allow). Finally (in the case of photos), please don’t forget to get permission/a model release from anyone featured prominently! Depending on team resources, we may also end up expanding the group to include a chat/message facility where we would post a description of an image we need and the deadline so that members can add an image to fit this (or email one to the editor in question). If you’re interested in joining this group, but don’t have a Yahoo/Flickr ID to be able to request to join through the Flickr link, please email editor@thefword.org.uk or art@thefword.uk. We may be able to move the pictures over to another space. Suggestions welcome! Please note that, while we are focusing on images of disabled people in this call-out (due to this being the area most in need of improvement), we also welcome images of people from other underrepresented marginalised groups. The photo is by Mary Austin and is used under a Creative Commons licence. 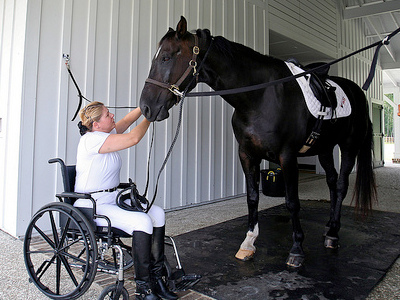 It shows a woman, Kim Jones, dressed in riding clothes and boots and using a wheelchair, attaching the bridle of a horse, Star. A. Go to https://www.flickr.com/groups/tfw_diverse_images/ while signed into Yahoo. B. Click on ‘Join group’ (which appears to the right of the title in the picture strip). C. This will generate a white box letting you know that the group is invitation only. D. Type a short message in the box, briefly letting us know who you are, then hit send. 2. You can send us a message at editor@thefword.org.uk or art@thefword.org.uk and we will send you an invitation. 3. You can use the comment form under the article to send us your details. This would just be for the purposes of taking an email address. The comment will not be published and we will delete it from WordPress when we have gleaned the relevant info.